WINDOW ROCK, Ariz. (11-21-2014) – The Healthy Diné Nation Act of 2014 was signed into law today by President Ben Shelly, following the Navajo Nation Council’s approval on Nov. 14. The new law will initiate a two-percent sales tax, in addition to the current five-percent sales tax, on sweetened beverages and food items deemed to have minimal-to-no nutritional value. The bill was sponsored by Council Delegate Danny Simpson, who represents the Navajo communities of Becenti, Crownpoint, Huerfano, Lake Valley, Nageezi, Nahodishgish, Tse’ii’ahi, and Whiterock. Simpson collaborated with Diné Community Advocacy Alliance, a Navajo Reservation-based organization, for nearly two years to develop the initiative. Simpson and DCAA members had sponsored two similar pieces of legislation. One of the bills was disapproved by the Council in July 2013. The second was approved by the Council but then Shelly vetoed it in February. Simpson commended DCAA members for their persistent efforts in promoting healthy living among Navajo people and communities. Food with “minimal-to-no nutritional value” includes sweetened beverages and prepackaged and non-prepackaged snacks stripped of essential nutrients and high in salt, saturated fat, and sugar including sweets, chips, and crisps. Revenue collected from the two-percent sales tax will be deposited into a Community Wellness Development Projects Fund that the Navajo Nation Division of Community Development will administer. DCD will then disburse the funds to the reseration’s 110 chapters to generate, match, and/or improve community wellness projects such as, farming and vegetable gardens, farmers’ markets, healthy convenience stores, wellness and exercise equipment and supplies, and others. 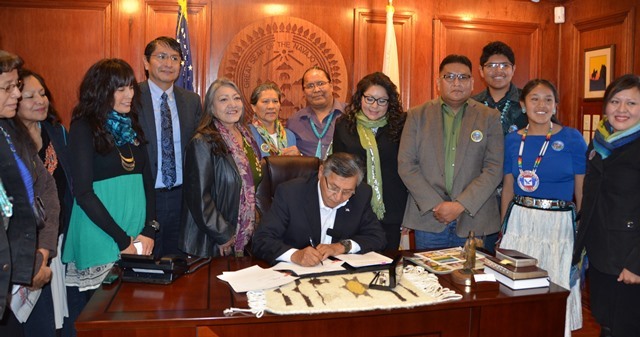 Speaker Pro Tem LoRenzo Bates, who represents the communities of Nenahnezad, Newcomb, San Juan, Tiis Tsoh Sikaad, Tse’Daa’Kaan, and Upper Fruitland, said the new law will challenge the Nation and the chapters to develop plans on how to utilize the funds. “This sets new precedence for our Nation and it will ultimately challenge our chapter officials to determine how best to use the funds to implement healthy initiatives,” Bates said. The new law will remain in effect until the year 2020, unless extended by the Council. Livingston and her fellow DCAA members also worked with Simpson on a separate legislation to eliminate the five-percent sales tax on fresh fruit and fresh vegetable items sold on the Navajo Nation. The measure was approved by the Council in January 2014 and took effect on Oct. 1, 2014. Simpson also thanked Council Delegate Jonathan Nez, who represents Shonto, Navajo Mountain, Oljato, and Ts’ah Bii Kin, for his continued support of the legislation and his efforts to promote healthy living. Nez commended DCAA members for bringing forth the initiative. “You are champions for the Navajo Nation, for Indian Country, and for the entire world,” Nez stated. The legislation cites information provided by the Navajo Area Indian Health Service, which reports that approximately 25,000 Navajo people are currently diagnosed with diabetes and another 75,000 are pre-diabetic. “This historical event is our present to the future. We will not live a life meant to survive, but a life meant to thrive ― this is the heart of the Healthy Diné Nation Act,” Livingston added. Delegate Simpson said he and DCAA members will continue meeting with the Office of the Navajo Tax Commission and they expect the law to take effect in January 2015. This entry was posted in Professional Journal and tagged Healthy Dine' Nation Act, Nation Nation Council, Navajo Nation, President Ben Shelly by Marley Shebala. Bookmark the permalink.